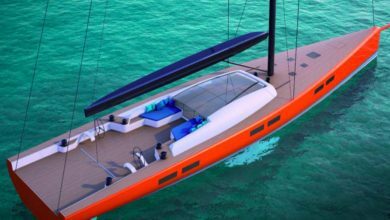 Philippe Briand has unveiled his latest sailing yacht concept: the 90-metre (300-foot) SY300. With a traditional sailing rig, the 1,550-tonne ketch has been created to outperform other sailing megayachts on the water today, as well as to provide a head-turning aesthetic and ultimate comfort on board. The new SY300 is an authentic sailing yacht in all aspects. 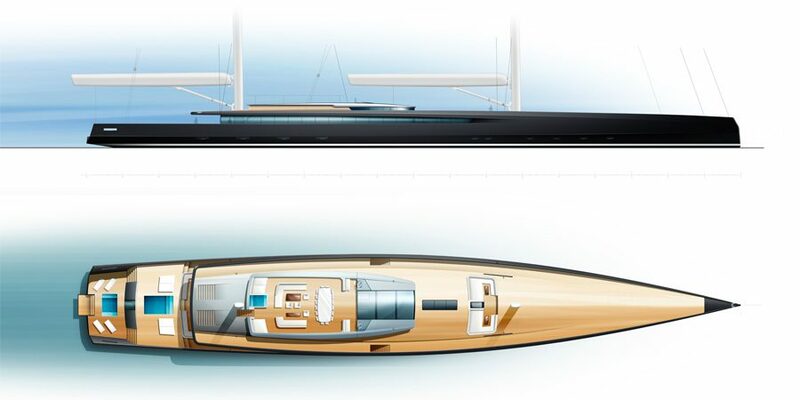 It has been developed with a similar design approach to that used in smaller, high-performance racing yachts while boasting the hallmarks of Philippe Briand’s award-winning design pedigree: clean, dynamic lines and outstandingly efficient naval architecture. Being fully wind-propelled, the SY300 would be a leader in the new wave of “green” superyachts; in particular, its hull-form characteristics and predicted performance would put the SY300 at the forefront of this cohort of vessels. 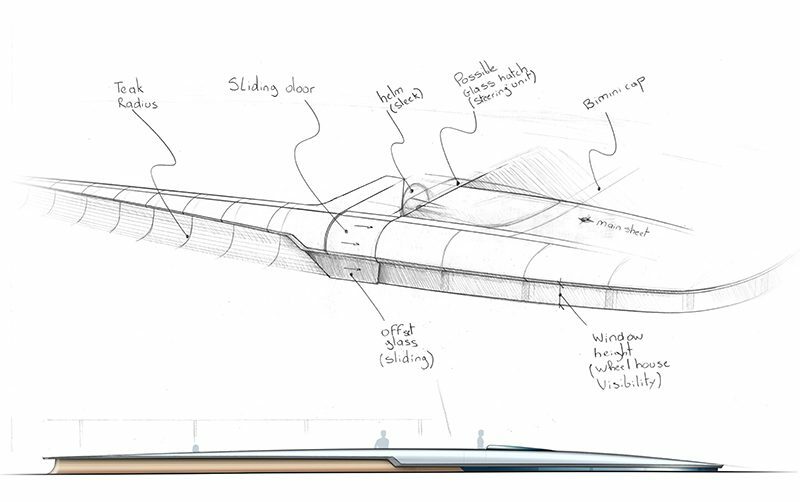 Its hydrodynamic efficiency means more power could be harnessed through underwater turbines to charge the batteries on board. In the best conditions a maximum speed over 20 knots would be reached . Potentially if 50% of the energy is captured it will be the equivalent of that produced by a 500 kW generator, while maintaining a speed around 15 knots. 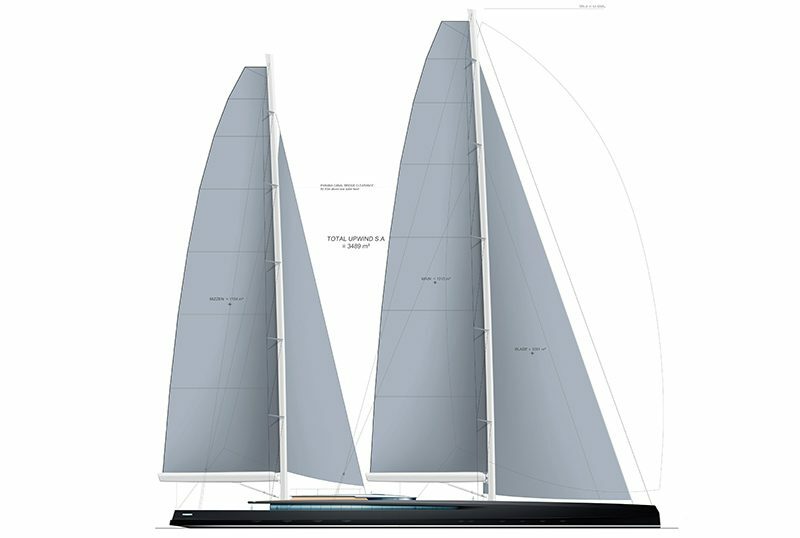 Philippe Briand chose a conventional two-masted sailing rig to complement the contemporary hull with its inverted bow. With its foremast towering 95.3 metres above the waterline, the SY300’s upwind sail area is 3,560m2, while its downwind sail area is 6,600m2, including a 3,500m2 spinnaker. The yacht’s length at the waterline is 78 metres, with a maximum beam of 14 metres. Although the sailing yacht design includes three capacious decks for ample guest space, Philippe Briand has been careful to ensure well-balanced proportions deliver a sleek overall aesthetic. This includes a spectacular fly bridge in the flush sun deck, which covers an area of 112m2 and 14.8 metres in length. The star attraction of the exterior, the flying bridge will be a magnet for friends and family to come together, where up to 14 guests can experience the thrilling sensation of movement created by harnessing the natural power of the wind. Of course, full enjoyment of the SY300’s exterior can come at anchor or in port as well as while cruising or racing. Each of the three decks offers guests a choice of swimming pool, paired with oversized sun pads or sun loungers. Interior layouts can be tailored to an owner’s desires, but initial drawings of the SY300 allow provision for a large full-beam owner’s suite with his-and-hers bathrooms, an office and a private terrace on the main deck. A full-beam saloon leads forward to a dining room on the port side or a play room on the starboard side, and a second door to the owner’s office.